Editor’s note: This first part of a two-part article on Catholicism and the death penalty was originally posted on July 17, 2016. 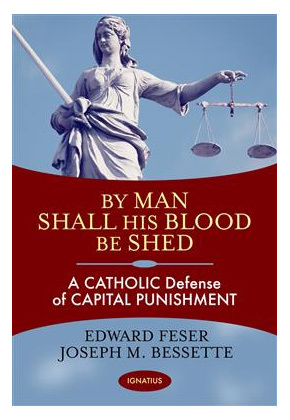 It is reposted now that By Man Shall His Blood Be Shed: A Catholic Defense of Capital Punishment (Ignatius, 2017), written by Dr. Feser and Dr. Bessette, has been published. The fact is that it is the irreformable teaching of the Church that capital punishment can in principle be legitimate, not merely to ensure the physical safety of others when an offender poses an immediate danger (a case where even John Paul II was willing to allow for the death penalty), but even for purposes such as securing retributive justice and deterring serious crime. What is open to debate is merely whether recourse to the death penalty is in practice the best option given particular historical and cultural circumstances. That is a “prudential” matter about which popes have no special expertise. We defend these claims in detail and at length in our book By Man Shall His Blood Be Shed: A Catholic Defense of the Death Penalty. What follows is a brief summary of some key points. The Church holds that scripture is infallible, particularly when it teaches on matters of faith and morals. The First Vatican Council teaches that scripture must always be interpreted in the sense in which the Church has traditionally understood it, and in particular that it can never be interpreted in a sense contrary to the unanimous understanding of the Fathers of the Church. St. Paul’s Letter to the Romans teaches that the state “does not bear the sword in vain [but] is the servant of God to execute his wrath on the wrongdoer” (13:4). The Church has always understood this too as a warrant for capital punishment, and by Brugger’s own admission, there was a “consensus” among the Fathers and medieval Doctors of the Church that the passage was to be understood in this way.ii But in that case, attempts to reinterpret the passage cannot possibly be reconciled with a Catholic understanding of scripture. Not only Genesis 9:6 and Romans 13:4 but also passages like Numbers 35:33, Deuteronomy 19: 11-13, Luke 23:41, and Acts 25:11 all clearly regard capital punishment as legitimate when carried out simply for the purpose of securing retributive justice. The lex talionis (“law of retaliation”) of Exodus 21 and Leviticus 24 is also obviously a matter of exacting retribution for its own sake. Deuteronomy 19:19-21 talks of execution as a way of striking “fear” in potential offenders, and deterrence is clearly in view in Romans 13:4. Hence scripture clearly teaches that capital punishment can in principle be legitimate for the sake of deterrence. It is sometimes claimed that Tertullian and Lactantius were exceptions to the patristic consensus on capital punishment as legitimate at least in principle, but even Brugger admits that this is not in fact the case.iii And again, the Fathers also uniformly regarded scripture as allowing capital punishment, and the Church teaches that the Fathers must be followed where they agree on the interpretation of scripture. The Church has also regarded the Doctors of the Church as having a very high degree of authority when they are agreed on some matter of faith or morals. Like the Fathers, these Doctors—including thinkers of the stature of St. Thomas Aquinas, St. Robert Bellarmine, and St. Alphonsus Ligouri—are all in agreement on the legitimacy in principle of capital punishment. Aquinas even dismissed as “frivolous” the suggestion that capital punishment removes from offenders the possibility of repentance, arguing that “if they are so stubborn that even at the point of death their heart does not draw back from evil, it is possible to make a highly probable judgment that they would never come away from evil to the right use of their powers” (Summa Contra Gentiles III.146). No pope from St. Peter to Benedict XVI ever denied the legitimacy in principle of capital punishment, and many popes explicitly affirmed its legitimacy, even as a matter of basic Catholic orthodoxy. Next post: Is Mormonism Christian?